When I read romantic suspense, I look for something different, something that would make the story unforgettable - new methods of investigations, unexplored settings or special heroes and heroines. The main characters of my story sort of walked up and introduced themselves to me as “something different.” Despite conventional backgrounds - Joss is an FBI agent and Ethan an ex-marine security guy – their working relationship takes them beyond stereotypes. They are two smart people, struggling to trust each other while working together. A woman in charge and a man who doesn't mind being her partner, a woman who doesn't secretly dream of picket fences and a man with no commitment issues. In short, Joss and Ethan feel like real people, with complex emotions, deep and complicated friendships, and personal histories to embrace and overcome. I truly hope you’ll enjoy the suspense as much as the romance and I welcome questions, comments and opinions about Joss and Ethan’s story. Write a comment here or contact me after reading the book, and most of all, thank you for taking a chance on TAKE. Ethan leaned his back against the wall and crossed his arms over his chest while he waited for Joss. He checked his wristwatch at least fifty times before she came back with a guard carrying some special detecting devices. One was similar to a hand vacuum, capable of sniffing and recognizing explosive residue better than a dog. The others were a couple of small boxes as big as a walkie-talkie, a more sophisticated and sensitive version of the electronic nose used to analyze the light signatures of chemicals the way astronomers learned the composition of stars. He tilted his head back and glanced at Joss with an arched brow. His mind was working on all of the possible scenarios involving the duffel bag, while his heart craved to know who the hell the woman in front of him was. She'd remained calm and detached under a possible threat, so she couldn't simply be an average Jane. “Agent Dubois? Please come here,” called the security guard. And she left. She, her husband, and their two boys live in a condo not far from the sea in northwest Italy. They share a huge Hotwheels collection, a kitchen full of cooking gadgets, and a home-office that resembles Doc's lab in Back to the Future. 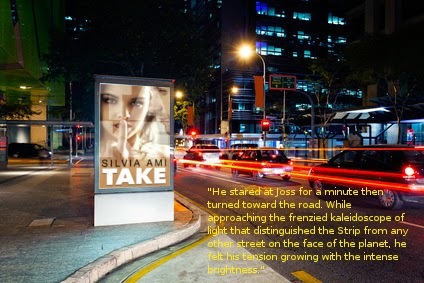 Silvia wrote TAKE after dreaming about the story and not being able to shoo the characters from her mind. Now that they are finally out, they have been replaced by the rest of the Gallagher clan. If you want to know more about them, stay tuned for upcoming releases. Take sounds like a book I would enjoy. I love books with FBI agents and the setting in Las Vegas with threats against dancers there has me really wanting to read this one. Great excerpt! I love FBI agents in books. WOW!! This sounds very exciting. I am so lucky to have edited "Take" and to have worked with such a talented, wonderful author. I love how strong yet vulnerable, funny yet serious Joss is, and she is truly such a memorable MC. The mix of suspense and romantic tension is fantastic, and I cannot wait for more from you, Silvia. Congratulations! Sam, the best editor in the world! Joss and Ethan’s story sounds very interesting... thanks for a bit about their story with us... liking what I see! Thank you, pleased to read your comment!